I am excited about my newest Exhibit and Artist Talk at HDR Architecture and Engineer firm in Lawrenceville N.J. I am honored to announce that I have received the 2016 Mercer County Cultural and Heritage Purchase Award for my painting "First Snow"
I am so excited to announce that my work has been selected by the Art In Embassies program! I will be sending a few of my paintings to live in the United States Embassy in Muscat Oman. I am very excited to announce that I will be having a Solo Exhibition at Artworks in Trenton in their community gallery! come out on March 5th from 6-8 to the opening and check out the exhibit. Come out and join me on January 7th at Hopewell Valley Vineyards from 6-9 for Prindiville Moher Gallery's new Pop Up Exhibition "New Year, New Art" Live Jazz music to accompany all of the Fine Art. I am very pleased to announce that I will be displaying my paintings with Alfa Art Gallery in New Brunswick this November in their New Brunswick Artist Salon! Join me for the opening on Friday November 13th. I will be taking part in Naked in New Hope #9 at the Sidetracks Gallery in New Hope Pennsylvania. September 12 from 6-9 I hope to see you there! I will be exhibiting two paintings at the Main Line Arts Center in P.A. for their Spring Gala. This should be a wonderful exhibit. I am happy to announce that I was selected to participate in the 2015 "Ellarslie Open" at the Trenton Museum. 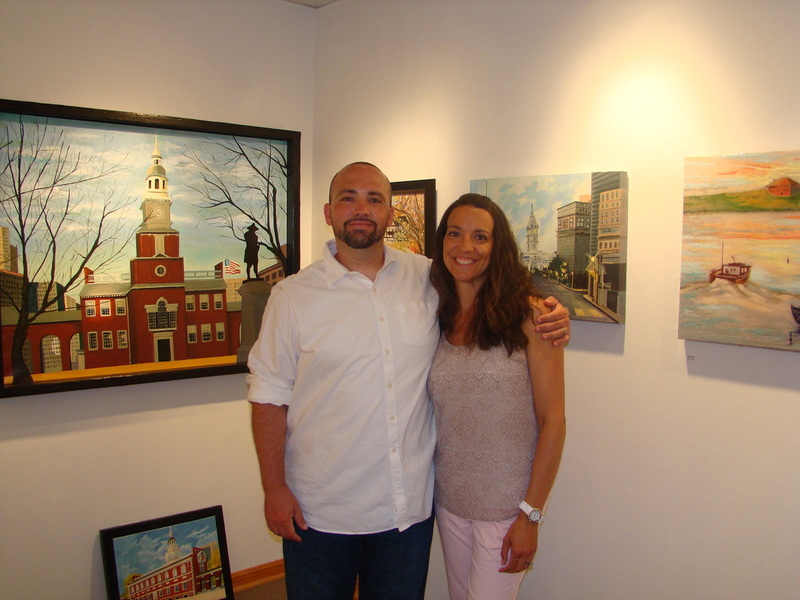 I have been selected to participate in the 4th Annual Artists of Yardley Juried Exhibition. My painting "Jersey Boys" is one of the featured paintings on the gallery card. I am Returning to Alfa Art Gallery in New Brunswick for their December Small Works Exhibit. The opening reception will be held on Friday December 12th from 8-10pm. Come out early parking can be hard to find! I will be a part of the New Brunswick Artist Salon held at the Alfa Art Gallery. The show will run from November 4th-24th. The opening is on November 14th from 8-10. Please come out and join me at the Alfa Art Gallery located at 108 Church St. in New Brunswick. I am pleased to announce that I will be displaying multiple paintings at Artists' House Gallery's exhibition "Philadelphia the Streets Where We Live" the opening is First Friday October 3rd from 4-9 with the Artists reception on Sunday October 5th from 2-4 . The Gallery is located at 52 north 2 St. in Old City Philadelphia. I am pleased to announce that I have been selected to display 3 of my pieces in the 8th Annual Naked in New Hope exhibit. The Opening reception is September 6th 2014 from 6-9 pm . The show runs until October 25th. I will be exhibiting my 2014 collection at Artists' House gallery's "Studio Show" from August 1st till September 17th. I will have four paintings at Artists' House gallery for the exhibition "Philly to the Shore From Brick to Sand" for the month of July. I am Very Excited to announce that I have been selected to show one of my paintings at The Ellarslie Open 2014. The show will run from May 3 through June 22 at The Ellarslie Mansion in Trenton N.J. I will be displaying my work in the 2014 Mercer Artists Juried Art exhibition. The opening will take place on Thursday March 13 from 5:30-7:00 at Mercer County Community College's Art gallery. I will be having another Triumph Show! This time I am coming to Triumph New Hope, Come check out my work from May through June. My 2013 collection will be on display at Triumph Brewing Company 138 Nassau St, Princeton, N.J. The Opening will be on January 7th, Over 50 paintings created in multiple mediums.